Now, I'm going to write about our wedding in Japan. We had the Japanese traditional shinto wedding ceremony and reception at a shrine called Toga Jinja (砥鹿神社）in Aichi prefecture. Even if you are not Japanese and not a shintoist, you can still have a wedding ceremony at a shinto shrine and there it no requirement to be a shintoist for that. The reason why I decided to have our wedding at this shrine is because I visit this shrine every new year day. When you have a wedding ceremony at a shinto shrine, you are required to wear the traditional Japanese kimono. It doesn't need to be a white bridal kimono, but a coloured kimono is also allowed to wear. The white bridal kimono has 3 layers. 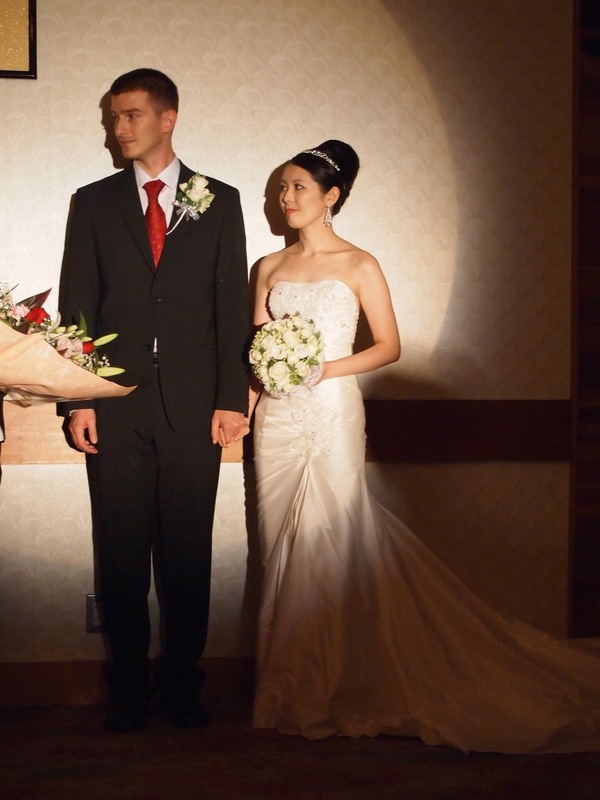 We had our wedding ceremony in the middle of summer, August, in Japan. Summer in Japan is terrible, because it's very humid and very hot. So, wearing that kimono in summer was very hard. And we usually wear a bridal headpiece - either the Wata-boushi or "Tsunokakushi". They are something like a wedding veil in the western-style wedding dress. Below the bridal headpiece, we usually wear a wig - a big wig. Normally, we chose either Wata-boushi or Tsunokakushi for the ceremony, but I wore the Tsunokakushi before the ceremony just to try, and wore the Wata-boushi for the ceremony. And recently, many young brides prefer a mixture of the Japanese style and the Western style, so brides may have western style hair instead of wearing a wig. This bridal headpiece is similar to the wedding veil, so after the ceremony, they are removed. The wedding ceremony is held inside of the shrine. Some shrines allow only families and relatives of a bride and a groom to be inside of shrine, but Toga-jinja allowed all my guests to be inside of the shrine and witness our wedding ceremony. The ceremony is performed by shinto priests. They give us a chant in front of shinto god. Then the groom reads an oath, saying something like "thank you for leading us to be together, we promise to make a happy and healthy family, promise to help other people and to contribute to the society.". This oath is usually read by a groom, so my husband practiced very hard to read this oath in Japanese, and he did a great job. After the oath, we have a ceremony called "san-san-kudo (三々九度)", in which the bride and groom take three sips of each of three different bowls of sake in turn. After that, many people exchange wedding bands following the Western custom. But, for me, it is very weird to bring the Western custom into the traditional Japanese wedding and also because I wanted to leave the exchange of rings for our wedding in Croatia, we didn't exchange the wedding bands in that time. After that, Miko (female attendants) gives a traditional shinto dance. That's the most of the Japanese style wedding ceremony. You may notice, but we actually don't have a celebrant and witnesses for marrying us on paper. Marrying in Japan is very easy. You just need to fill a 1 page form (a marriage registration) and file it with a local government office. If the office is closed because you go there after their working hour, then you can post the form into a post set at the office. So, some people just fill the form at home and file it with the local government office without having the wedding ceremony and the reception. After filing the form, the local government office send you a notice that your marriage is accepted. On the other hand, some people, but not many, sign the marriage registration in front of the guests at the wedding ceremony or at the reception. But of course, if you are non-Japanese who is marrying to a Japanese citizen, then you need to prepare extra documents, such as your birth certificate and so on. After the wedding ceremony, we had the reception, which is tightly scheduled so as to end in 2 to 3 hours. For the reception, I changed to a Iro-uchikake (a coloured kimono with patterns). This also has 3 layers. I could have changed my hair to a western hair style from wig, but because I didn't have much time for that, I decided to keep wearing the wig. Wearing kimono is not easy. Usually, we have 2 assistants who dress us kimono. At the reception, we showed our guests a video, which is created by my husband, to introduce ourselves and backgrounds. The video shows, usually, photos of childhood, some memorable events in life or a bit of story about a couple. This is because most of guests don't know the bride and groom well. Actually, it could be the first time that your relatives or friends meet your partner. In fact, only some friends at our wedding reception know my husband at that time and more than half of the guests didn't know him and met him for the first time. Then, usually, bosses of the groom and bride give speeches to tell their story at work (often a bit of commercial of their company and tell how wonderful worker you are). So, the wedding reception is considered as an opportunity to introduce the bride and groom to people. After the speeches, people can be more relax and enjoy food. But for the bride and groom, they don't have much time to eat, because the guests visit you to cerebrate you and take photos with you. So, in our cases, we only had a few bites during the reception and ate properly after the reception. During the reception, we have "candle service", cake cutting or opening a sake-barrel, mini-games, entertainment by your friends and so on. The candle service is often carried out after you change your close and enter into the reception room again. Before you reach your table, you visit each table and chat with guests while lighting candles on the tables. The cake-cutting is the same as in Western-style wedding. In addition to the cake-cutting, giving "a first bite" to each other became popular in Japan. The first bite in Japanese wedding means, you give a spoon of cake to each other. Opening the sake-barrel is often carried out instead of cake-cutting. When the bride and groom wear the traditional Japanese kimono for the reception, often this alternative is chosen. We had this sake-barrel opening. After you open the sake-barrel, you pour sake to each guest's cup and toast! There seem very much things to do in a tight schedule and you may get panicked or nervous, but don't worry. There are many staff working for you and they keep time and give you instructions what to do next. At the end of the reception, often the bride reads a letter to her family. In Japan, the wedding ceremony is connecting two different families. And the bride is considered to leave her family and entre the husband's family (could be vice versa though...). So the family of the bride, it is very sad and very emotional event. Often, when the bride reads the letter, tear accompanies... We also give some gifts to our parents at the end of the reception, usually flowers and a small gifts. This has a purpose of preparing to see off the guests. When we finish the reception, the bride and groom and their families see of the guests at the exit of the room, so this gift giving makes the schedule smoothly move to the end. This is also a good sign for the guests to tell them that the reception is ending and get ready to leave :P When we see off the guests, we also give a small present to them, something like cookies or chocolate.